Marisa Mayer’s decision to end work-from-home privileges at Yahoo calls attention to one of the most significant realities of the 21st century office: technology has changed the way we use space, letting us take our work virtually anywhere, but also requiring greater energy demands of our workplace. The changing face of the workplace has directly affected the role of facility management teams, who are now tasked with managing more malleable spaces with the potential for different use patterns and greater energy needs than ever before. The U.S. Green Building Council (USGBC) has stated that buildings in the U.S. are responsible for 13% of the country’s water consumption, as well as nearly 40% of both energy consumption and CO2 emissions. IWMS and CAFM software provide solutions specifically aimed at helping companies achieve their sustainability and emission goals. FM: Systems’ Director of Marketing Brian Haines commented on how facility management software solutions like FM:Systems are filling a gap in the market: “One of the key points for our market, which is companies that own and operate their own facilities, is that most of the products out there are designed for Architecture, Engineering and Construction, which doesn’t help much once a building is online. 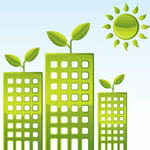 We’ve built our Sustainability module specifically for owners of facilities who need to take a programmatic approach to sustainability for the entire real estate portfolio.” As more and more workplace and facility management options become available to businesses, the benefits of going green are becoming even more clear. If your company is based in the UK, you probably already know about the legislation that makes emission data reporting compulsory for many companies. Around the world greenhouse gas tracking and reporting may not be mandatory, but keeping track of your carbon footprint can still be a critical part of brand development. Voluntarily demonstrating a dedication to sustainable practices earns big points when it comes to customer-facing brand-building, and one way for American companies to publicly indicate a commitment to green business is through LEED certification, wherein the USGBC evaluates and rates a business based on its consumption of resources, output of carbon emissions, and other important metrics. Whether you’re striving to meet government mandated regulations, qualify for certification, or simply build a greener brand name, IWMS and CAFM software options provide you with the tools needed to accurately measure and analyze your emissions. David Stillebroer, Product Manager for Planon, who has worked extensively in the sustainability sector, says that when selecting a software system, companies must consider the emission requirements of their location, their industry, and the level of “green” efforts they have been making prior to implementing the software. If you need fast implementation and immediate reporting and monitoring, a user-friendly, out-of-the-box solution like Planon Accelerator might be a great fit. Stillebroer told us that users should focus on looking for software with easy to use data input, the ability to calculate carbon emissions according to the standards of the location, and strong reporting and dashboard functionality. This final feature is important because it empowers companies to use their data to find opportunities to improve their usage and reduce energy consumption. As Stillebroer recommends, finding software with excellent dashboards can make a huge difference in implementation success. Facility management software dashboards provide an easily digestible, measurable way to track your progress, discover pain points and work to improve them. Some companies are even starting to figure out ways to involve the whole team in sustainability efforts; Cloudapps offers a gamified sustainability module to encourage and reward green behavior, inspiring accountability in everyone from managers to custodial staff. Looking forward, Stillebroer says we can expect facility management to be an innovative field in the next 10 years, leading the way in sustainability and energy efficiency, especially in the “integration of the processes of the user and innovation in the intelligence of the building itself.” He gives an example of the high-tech energy conservation techniques that are already being implemented in some workplaces, including his own: “Look at my own office; we have meetings rooms, and we have software that lets you plan your meeting rooms or make a reservation for a workstation…software like Planon knows when a space is reserved, and the building management system is programmed to heat that room- tomorrow, when I have only meeting planned, it knows that it’s not necessarily to heat that specific area all day.” Because buildings account for such a huge percentage of energy consumption across the globe, they provide a great target for creating more efficient consumption models. Whether they specifically work to provide sustainability features or not, all facilities management software programs can help you save significant money while cutting down on your resource use, thereby decreasing your carbon footprint. One Scottsdale company working with FM: Systems saved about $65 million and has been able to maintain LEED certification since implementing a sustainability software program, proving that the benefits of a well-run green campaign can yield huge rewards. Preventative maintenance scheduling can significantly extend the lifespan and efficiency of your assets. Just as regular smog checks for your car can help you detect potentially costly problems with your car while also decreasing your environmental impact, sustainability modules and software programs can help drastically reduce unnecessary spending and excessive emissions. Want more on Asset Management Software? Discover and learn more about facility maintenance and asset management software by exploring blog posts, whitepapers and more on our Asset Management resource page. For comparisons of the best facilities management software, download Business-Software.com’s Top 10 Facilities Maintenance Software report.